The Women’s Board Chair Lyn Swinburne AM today announced that the Women’s was seeking to become a White Ribbon Australia Accredited Workplace. 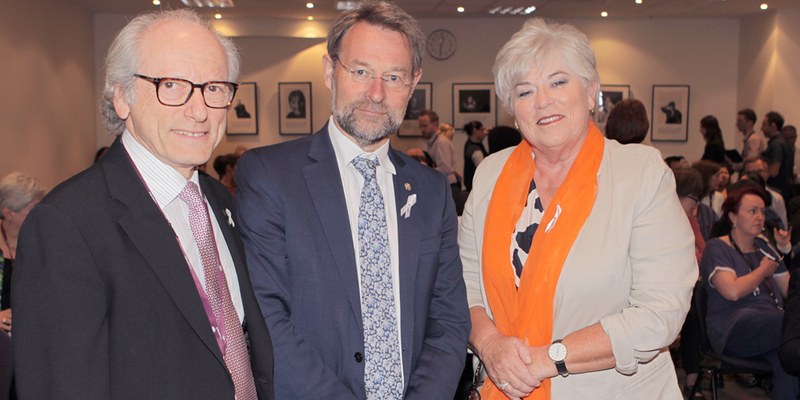 Speaking at the Women’s White Ribbon Day Grand Round, Lyn said the accreditation aligned with the Women’s commitment to Preventing Violence Against Women (PVAW). “At the Women’s we have a major focus on supporting women in our community, and the White Ribbon Accreditation is about taking those same initiatives of awareness-building and support, and applying them within, and for, the women in our workplace,” Lyn said. White Ribbon Accreditation provides support, structure and tools for an organisation to prevent and respond to domestic violence experienced by staff. “Our objective is to empower our staff with best practice knowledge and expertise, so they can respond appropriately if a woman is identified as experiencing or at risk of experiencing violence,” Lyn said. The Board Chair told the audience that violence affects women physically and mentally. “The Women’s has a unique and vital role in helping to protect women and children who are at risk of violence. She said research showed a shocking one in three women reported having experienced physical violence by the age of 15. “At the Women’s we are working hard to stop these terrible trends and we are providing leadership to the Victorian health sector to help prevent violence against women. “For us, this issue is not new. We have been caring for the most vulnerable for almost 160 years.